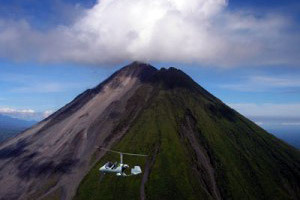 The two-day-trip to Volcano Arenal provides the unique opportunity to watch Costa Rica’s fascinating landscape from a birds perspective. Werner and Maria Westphal wrote a trip report which illustrates the extraordinary, special experience of the tours we organize. Equipped only with small luggage and a camera my wife and I stand at the hangar of the flying crocodile hotel watching our pilots as they inspect the aircraft. We cannot deny our excitement, considering this is our first flight in an ultralight. 15 minutes later the two auto gyros – a crossing between a small airplane and a helicopter – are fueled up, and our two pilots Frank and Guido are ready for take-off. Before starting the engine Frank explains to me my ‘cockpit’ and warns me to never impede the control stick’s movements. Our destination today: Volcano Arenal, almost 1700 Meters of height and world-famous for its ‘friendly’ eruptions. Right after take-off we climb to 500 feet, and head north to cross over the mountain ridge of the Nicoya peninsula ten kilometers away. In front of us lies the beautiful River Tempisque valley glistening in the morning light. The sun stands right over the horizon and promises a wonderful day. Soon we glimpse the rectangular beams of the Amistad suspended bridge in the distance, all 800 meters of it built by the republic of Taiwan as a present to Costa Rica in 2003. We follow the bends of the river upstream and fly over ‘bird island’, where we are observed by storks, heron and other big birds. Some of them even keep us company for a while. 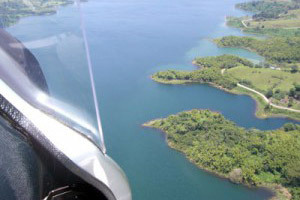 After thirty minutes in the air we reach the shores of Lake Arenal. This artificial lake is 35 kilometers long and down to 60 meters deep. We fly along the shoreline down to its southeastern tip. 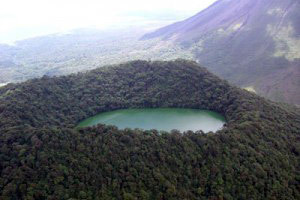 Here Volcano Arenal rises up to 1670 Meters, all of which we approach in a steep climb. Myths tell you volcanos are home to the gods of fire who can be of varying temper. In May 2010 they obviously had been in a particularly bad mood, for the volcanic eruptions had been so strong and fierce that the surrounding national park needed to be evacuated. As we reach 6000 Feet of height the air cools of noticeably, however, the vista is all the more glowing. The steaming crater appears at our side like a giant charcoal brazier. An unbelievable and almost surreal spectacle which leaves a deep and lasting impression. On we go to the Cerro Chato, the next volcano in a chain of many stretching out along the horizon from the south to the far north. My eyes are glued to the overwhelming scenery when Frank points out two cascades in the lush green below us. The panorama changes constantly, from impenetrable jungle to the fertile plain of Fortuna. As we approach the Fortuna runway, the tarmac seems to be only a narrow black line within a huge ananas plantation. Right in front of us Guido and my wife touch down, our aircraft follows as soon as their gyrocopter leaves the runway. While Frank and Guido secure our machines, Mia and I relish a strong hot costa rica coffee at the small airport bistro, totally elated with the experience. Never before we have enjoyed such insights, such outlooks. This flight has been a dream we never want to wake up from. In Fortuna we catch a taxi to the observatory lodge. The lodge is situated directly on the flanks of the Arenal Volcano, and allows us a close up sight on jagged lava fields which tell the history of the latest eruptions in this rugged terrain. After a walk through the ample grounds we reach a thundering fall in the jungle thicket. While Guido and Frank jump into the basin, Mia and I find time to take in the surroundings, to reflect on the events of the day, and to simply unwind. But alas, adventures fuel your appetite. Back in Fortuna we devour a delightful pizza in the cafe Vienna, and the finishing cappuchino is at least as good at the one at home. When we at last find ourselves in the hot springs of the Baldi ressort two hours later, we no longer believe this day only lasted 24 hours. In the tropical spa fed by volcanic springs our day fades out. Still, in in our dreams this night we already fly on over fascinating landscapes anticipating our flight back on the morrow. Passing the Volcano and cruising along the beautiful Lake Arenal to Canas – from their passing Nicoya on the way to the Hotel.